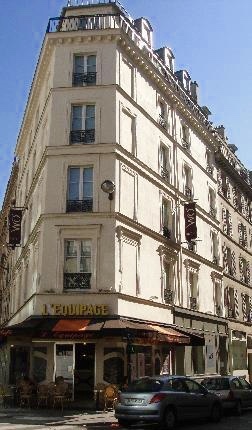 Fun and affordability in Paris' elegant 8th Arrondissement. The balcony of our room at Hotel Wilson Opera gave us a little view of the Eiffel Tower peeking up behind the building in the middle. On previous trips to Paris, Larry and I always seemed to traverse the city in a frantic fashion, zig-zagging from landmark to landmark and spending too much time burrowed in the underground consulting the route map of the Metro. Sure, we checked off many sites on our to-see list but I always returned home feeling like we'd seen a lot but experienced little. So, this year we decided to tour the city differently - slow down, condense our sightseeing to a smaller area and really take the time to experience our surroundings. Our hotel was a great 3-star boutique hotel tucked in among the stylish apartment buildings that are so prevalent in the 8th Arrondissement on the right bank. I had been attracted to this area on previous trips because of its quiet, residential atmosphere and beautiful tree-lined streets and boulevards. 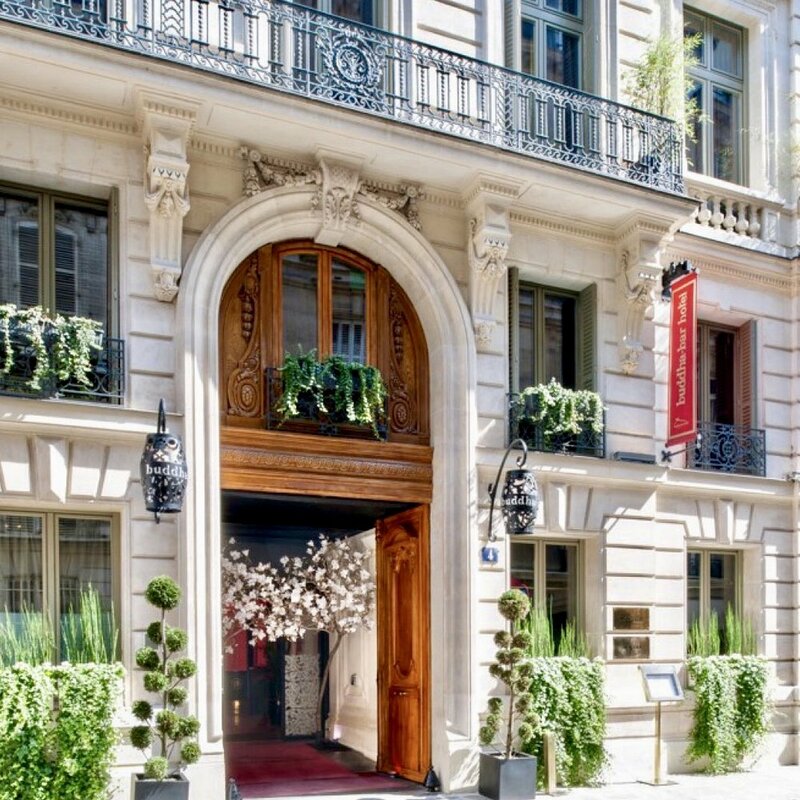 There are dozens of 5- and 4-star hotels in this upscale area including the Hotel Plaza Athenee, Shangri-La Hotel and the Four Seasons Hotel George V, but we loved our 3-star Hotel Wilson Opera, located just a few blocks off elegant Boulevard Haussmann. We arrived on Easter Sunday around noon and to our great surprise we had been upgraded from a basic French balcony room to one with a wrap-around balcony and a much larger sitting area. Plus, the room was ready which meant we could change out of the traveling clothes we had worn on the three-hour train ride from Bordeaux and into something a little nicer to wear to Easter brunch. The streets around the hotel were quiet both day and night. The bathroom wasn't large but it wasn't tiny either and was appointed with Nuxe natural bath products. The room was perfect for our needs and we could not have asked for a better room and view at our rate ($190/nt.) in this location. We may not have had all the extras the luxury hotels only a short distance away offered but we had everything we needed and the rates at those luxury hotels were five to ten times the rate we paid. The service at Hotel Wilson Opera was excellent and we appreciated the 24-hour reception. The view from our balcony provided an up-close look at the elegant apartment buildings which were the legacy of Georges-Eugene Haussmann, the Prefect of the Seine (similar to a governor of an area) in the mid-19th century. Between 1853-1870, Haussmann was tasked by emperor Napolean III (nephew of Napolean Bonaparte) to undertake the daunting task of bringing air and light to the city's dank, and overcrowded medieval neighborhoods rife with sickness, misery and very little fresh water. Napolean III had lived for a time in England and was impressed with London's wide streets, squares and public parks and wanted to incorporate those same elements into his plan to make Paris a modern capital city. Haussmann's urban plan included long, straight boulevards to open up and connect the city and he established a standard ratio between the height of buildings and width of streets. I had always wondered why so many of the buildings in Paris have a uniform look to them and it was by Haussmann's design. He regulated not only the height ratio but how buildings should be designed. Buildings could not be higher than five to seven stories high and roofs had to have a 45-degree pitch to allow daylight on the sidewalks below. Buildings had to be constructed of stone blocks with basements and ground floors. Above the ground floor was a "between " floor with a load-bearing wall below. The ground floor was usually reserved for shopkeepers. Above that was the first floor and then second floor - known as the "etage noble" or noble floor because apartments on this level were most sought after by wealthy families of the time. It was required that the second floor have a wrought iron balcony and detailed stonework around the windows. The interior featured elegant high ceilings, multiple reception rooms and was an easy walk up from street level since there were no elevators. Most third and fourth floors had little or no detail on the exterior and the top floors had balconies. The buildings were capped with mansard roofs which at the time were lit only by dormer windows and usually was where the maid's chamber was located. Haussmann wanted each block to have a uniform look so balconies on each building had to be in alignment the length of the block. These buildings and boulevards today are still so representative of the classic images of Paris. The French have never had a reputation for being big breakfast eaters but I read somewhere that in the last few years brunch had become "a thing" in Paris and that many restaurants were now offering elaborate weekend breakfasts. Since we would be arriving in Paris in the afternoon, we decided to make Easter brunch our "splurge" meal and after researching recommended places in the 8th Arrondissement we decided to give Le Vraymonde, the restaurant inside the Buddha-Bar Hotel, a try. I made reservations three weeks before we left for France because I was sure it would be impossible to just walk in and get seated on Easter Sunday so I booked the latest seating for brunch possible (2:30pm). It was only a 10-minute walk from our hotel to the very upscale Madeleine neighborhood where the Buddha-Bar Hotel was located just a street away from the Eglise de la Madeleine, the very large Roman Catholic church built to look like a Roman temple in the Neo-Classical style. We were seated in the courtyard which was a little chilly but staff provided plush blankets. The brunch cost 92 Euro per person and included a glass of Champagne, endless appetizer and dessert buffets and a choice of a main course, cooked to order (Teppanyaki lamb chops, Foil-baked pollack, Cheeseburger or Noodles with Japanese mushrooms). The The sweet and savory appetizers were arranged on four extensive buffets and represented cuisine inspired by one the four elements - Water, Earth, Air and Fire. Here's just a sampling - Water (Oysters, Live Sushi and Tartare); Earth (Country-style pate, smoked duck, Parma ham, sausage with truffle); Air (vegetable spring rolls, gazpacho); and Fire (chicken skewers, coriander-baked egg, spicy prawn tarts). The dessert buffet was set up in a separate room and included and elegant assortment of pastries including eclairs, creme puffs, fruit tarts and pain du chocolate but the highlight was creating our own Samurai Easter Egg. After selecting from an assortment of chocolate-egg bodies, helmets, shoes, arms and eyes we handed over the "parts" to the pastry chef who worked his magic by melding the pieces together and adding fondant hands to clutch two Samurai fighting sticks. We thoroughly enjoyed the brunch but I was glad we booked the late seating because I got the impression the restaurant had been much busier earlier in the day with large groups and lots of kids. After brunch we took a stroll along the Champs-Elysees beginning at the Place de la Concorde where the slow-rotating Big Wheel was transporting riders some 225 feet high for views of the city and especially the nearby beautiful Tuileries Gardens. I had planned a surprise stop for Larry at the L'Atelier Renault, the flagship store for the French carmaker. It's an interesting venue for viewing new, vintage and racing car models as well as interactive exhibits, retail space, cafe and bar. We each enjoyed a Stella-Artois beer overlooking the Champs-Elysees which was now bustling with pedestrians. As dusk fell, we continued our walk onto Avenue George V and crossed the Seine then headed toward the Eiffel Towel and purely by accident we arrived in time to watch the twinkling lights come on at 9 p.m. We strolled back to our hotel along the Champs-Elysees and stopped for a nightcap along the way. We noticed a nice little perk in this neighborhood when we stopped in for a beer or a glass of wine in these neighborhood bistros - free snacks. It wasn't uncommon to be served a bowl of nuts or olives to nibble on while we enjoyed our drinks. I don't remember getting complimentary snacks in other areas of the city. The morning of our final full day in Paris we shared a petit dejeuner breakfast at a nearby brasserie and sipped cappuccinos at our sidewalk table while we watched the hustle-bustle of the morning traffic at the nearby intersection. We wanted to get an early start to our day because we were headed to the Musee Jacquemart-Andre which is an intimate museum (one of the few in Paris open on Mondays) that can be subject to limiting admission to control overcrowding. Perhaps one of the most enjoyable things we did in Paris was tour the Musee Jacquemart-Andre. I had never heard of this museum before but came across information about it while researching things to do in the 8th Arrondissement. It is the magnificent former mansion of a French couple who traveled the world extensively and acquired a vast collection of paintings, sculptures, tapestries, furniture and other works of art. Edouard Andre was a descendent of a very wealthy banking family and spent his fortune on buying works of art and exhibited them in his mansion which took six years to complete. He married Nelie Jacquemart, a society portrait painter whom had painted Andre's portrait ten years earlier, and together the couple amassed one of the finest collections of Italian art in France. The Winter Garden is a highlight of the mansion. It was designed by architect Henri Parent, who was rejected for the job of designing Paris' Opera House so he took the opportunity to show the world his design flair with the Jacquemart-Andre project. Walking the exterior grounds and entering the salon of the mansion you immediately feel like you are in a home and not a cavernous art museum and could definitely imagine the high-society receptions hosted by Jacquemart and Andre in the mid-to-late 1800s' in their impressive mansion along Boulevard Haussmann. The entire first floor was dedicated to their Italian Museum and during the couple's lifetime only very close friends or prominent guests were invited to view their collection including pieces by Francesco Botticini (bottom left) and Sandro Botticelli (below middle). Andre favored Venetian Art and Jacquemart had an eye for Florentine art. The couple had an exquisite eye for art and their Botticelli painting was not attributed to the artist until much later adding significant value to the piece. They also instructed their agents to be mindful when bidding at auction so as not to drive prices beyond the means of the city's museums. Andre and Jacquemart never had children so when Edouard died in 1894, Nelie carried on with turning the house into a museum they had both agreed would be bequeathed to the Institute of France upon her death. Jacquemart died in 1912 and the home was inaugurated the Jacquemart-Andre Museum in 1914. The museum's extensive collection includes the works of dozens of world-renown artists including Anthony van Dyck, Rembrandt and Vittore Crivelli and multiple murals by Giovanni Battista Tiepolo. The Winter Garden is a highlight of the mansion. It was designed by architect Henri Parent, who was rejected for the job of designing Paris' Opera House so he took the opportunity to show the world his design flair with the Jacquemart-Andre project. Below are a few more photos of the Winter Garden which is an architectural masterpiece. We also toured the private apartments, reception rooms and informal salons. We highly recommend this museum. After we spent about three hours touring the Musee Jacquemart-Andre, Larry and I walked a few blocks north and found the beautiful Parc Monceau, a 20-acre public park located in the 8th arrondissement. The park is English-style and features a large rotunda and elaborate, wrought-iron gates at the entrance. Inside, the park features many architectural structures including a pyramid, windmill, Chinese fort and Corinthian pillars. The park has free WI-FI too. We took another stroll on Champs-Elysees and found the macaron mecca, Laduree. The line to buy macarons was too long but we scored a free sample of chocolate and continued our walk. We cut over a few blocks to walk along Rue du Faubourg Saint-Honore, one of (if not the) most prestigious and fashionable street in Paris. The official residence of the President of France, the Elysee Palace is on this street as are the residences of the Ambassadors to France from Britain, Japan, United States and Canada as well as many embassies. France's most famous brands have flagship boutiques along this narrow street including Chanel, Lanvin, Hermes, Baccarat and many more. I was mesmerized by the window-dressing designs and gobsmacked by the price tags. We veered off on Rue Royale and found ourselves in the quaint Place de la Madeleine and just steps from Boutique Maille, home of the famed gourmet mustard and vinegar producer. I had no idea Maille had been producing products for more than 267 years and made 84 mustard varieties and 120 vinegars. We were guided and encouraged by the mustard sommelier (yes, a sommelier of mustard), to taste as many varieties as we wanted. If you're in the area it is worth a peek inside to see the beautiful boutique and have a taste or two (or more). We only travel with carry-on luggage so unfortunately, we weren't able to buy a jar of one of the amazing mustards to take home with us. A few steps outside Maille, we found a bistro where we ate lunch. We shared a foot-long hotdog in a perfectly baked French roll buried in melted cheese. We were quite certain the mustard tasting had influenced our decision to order the hot dog. Not very French, but darn good. The interior of Galleries Lafayette department store. After lunch, we made our way back to Boulevard Haussmann in search of the luxury department stores, Printemps and Galeries Lafayette. The two stores occupy space in a massive Art-Nouveau iron structure each with its own soaring atrium enclosed with elaborate colored glass and both offer sweeping views of the city from their respective rooftop terraces. We chose to check out the terrace at Printemps because the store also had a Cafe Pouchkine outpost on its ground floor so we could pick up some pastries to take home for dessert. We ordered a couple of beers at the cafe on the 9th floor and went outside to enjoy the 360º view of the Paris skyline which included Opera Garnier, Eiffel Tower, Pantheon, Arc de Triomphe and Sacre Coeur. We were reminded of the nice view from our room at the hotel and decided to have dinner on our balcony for our last night in Paris. We selected two desserts from the Cafe Pouchkine patisserie before leaving Printemps and heading back to our hotel. The markets near our hotel were all closed so Larry came up with the idea of buying take-away from the train station (Gare Lazare), which was just a block away. There were so many options but we opted for a green salad and a quinoa salad with chicken. Back at the hotel, I spread out my scarf for a tablecloth and Larry opened the bottle of wine we had brought with us from Bordeaux. It was a perfect and perfectly-affordable end to our two nights in Paris. We enjoyed our salads and sipped wine as dusk fell and again at we were treated to the Eiffel Towel light show just catching a few twinkle lights on the top spire beyond the rooftops and the sweeping blue beacon. We both agreed that on this trip we had enjoyed seeing an intimate and elegant side of Paris, somehow managed to spend less money and felt far more relaxed.